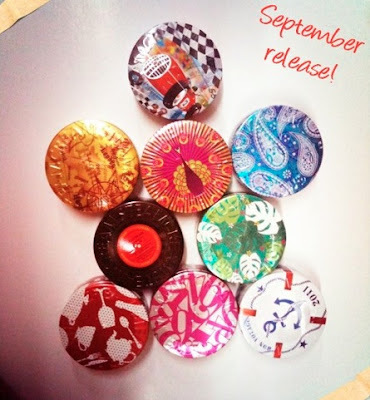 Steam Cream will be releasing these new can designs on 2 September at BHG in Singapore. Do also check out their Facebook page! 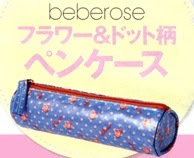 Just read on 2Channel that Gransenbon has ceased production and is being withdrawn from retail outlets in Japan. 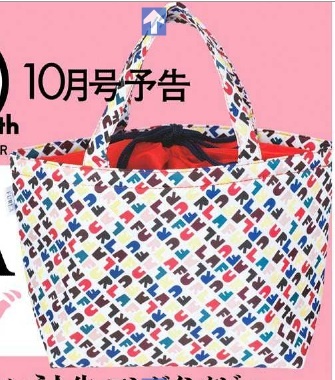 Even the official website has vanished from the website of its parent company, Cuore Cosme, which also makes K-Palette. 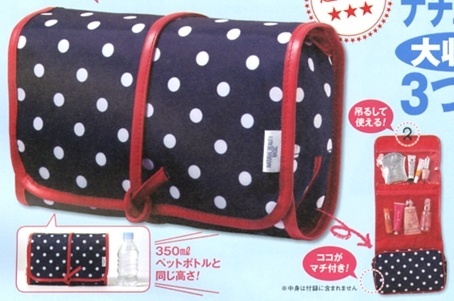 Gransenbon hasn't released any new products for many months now, so the prospects for it weren't looking good. It's always sad to see a brand meet its demise although to be fair, the brand's products were very much hit-and-miss. I'll treasure my collection of their blushes even more now. 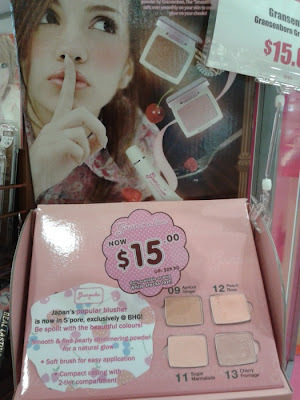 BHG has been selling Gransenbon blushes at just $15 each for awhile now. If you've been wanting to purchase them, don't wait too long! 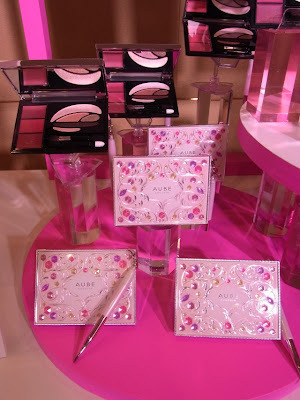 For this fall, Aube Couture will release a limited edition series of Designing Compact palettes (5250yen), each containing 5 eyeshadows and 3 lip colours. There are two palette cases and four shade combinations to choose from: 01 Platinum Purple (with pink lip shades), 02 Platinum Brown (with rose lip shades), 03 Platinum Orange (with red lip shades) and 04 Platinum Beige (with beige lip shades). 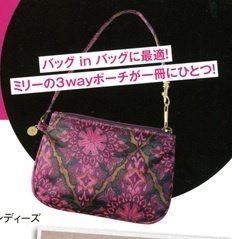 You can see a preview pic of the four combinations on Iroha and here. 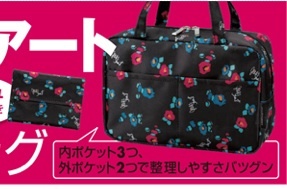 These will be released on 4 October in Japan. 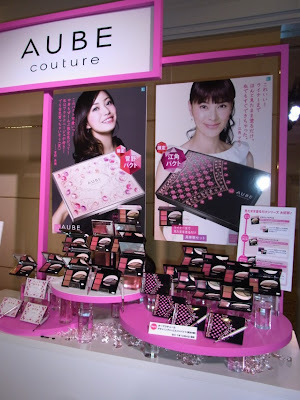 The ad visuals feature Japanese actresses Esumi Makiko (for the black compacts) and Kanno Miho (for the white compacts). Pics and info from Biteki.com. 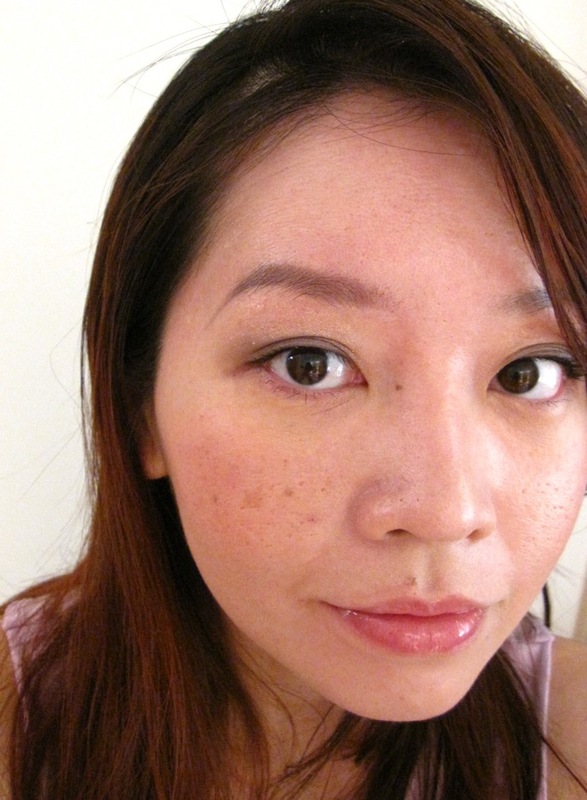 This week, I've been wearing the Suqqu Mascara Volume Long N, that I purchased as part of last year's Christmas Makeup Kit. 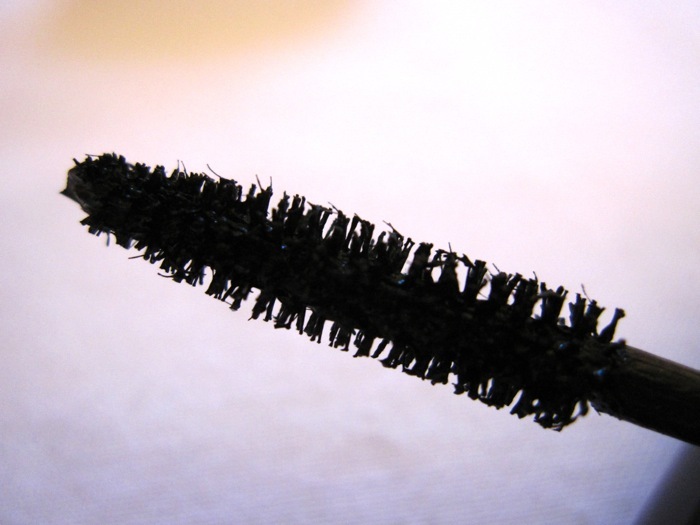 It is a water-resistant mascara containing resin fibres, that promises to help create soft, curled lashes. 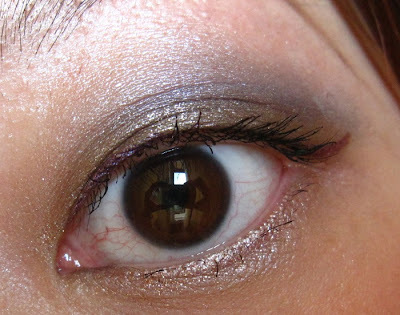 The mascara can be removed with warm water. The mascara is a deluxe sample size of 4g/0.14oz. 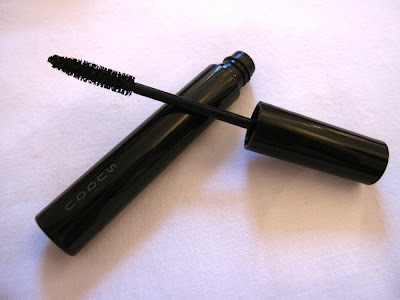 I could not find any information on the weight for the regular retail size but one of Suqqu's other mascaras is 4.6g. It retails for £29 (about S$58) in Selfridges in the UK and 5250yen (about S$83) in Japan. 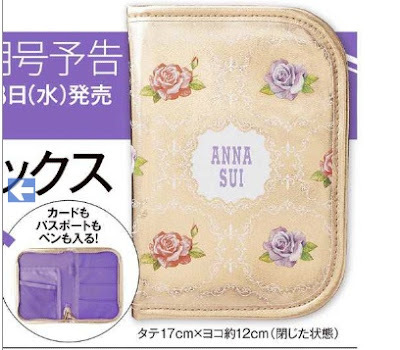 The price in Japan is way beyond what I would shell out for a mascara as mascaras have to be discarded after just a few months for hygiene purposes. 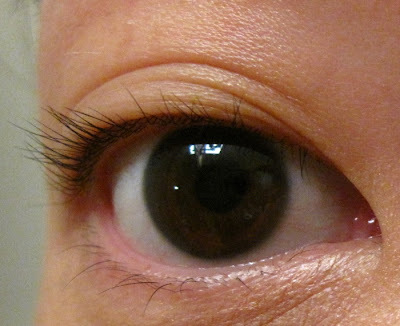 There are only a handful of reviews for Mascara Volume Long N on Cosme.net and most of them are negative, with criticisms of the mascara's lack of curling and volumising properties. 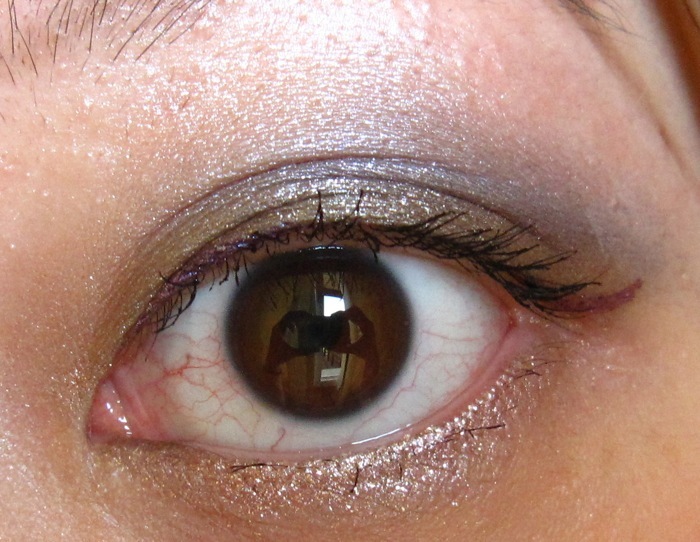 Also, attempts to remove it with just warm water often led to unsightly black smudges around the eyes. 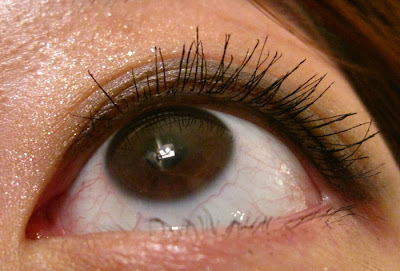 My lashes after using the MAC eyelash curler. 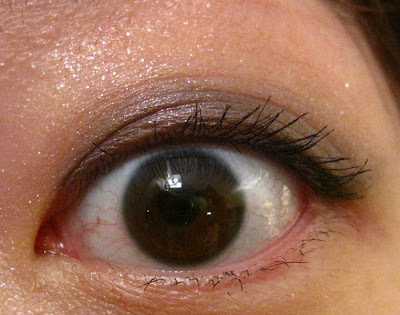 The first couple of times that I wore the mascara, it didn't hold the curl of my lashes very well although my lashes didn't straighten out completely. 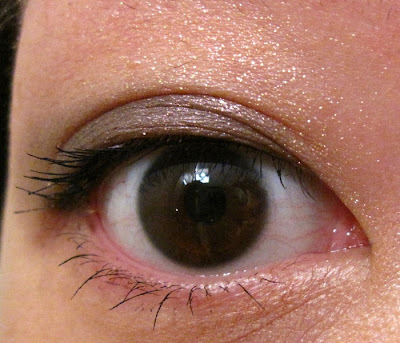 On the third try (which is pictured below), I got much better results and my lashes stayed nicely curled over more than 6 hours of wear without any flaking or smudging. The mascara is good for adding length and definition but not at adding volume. 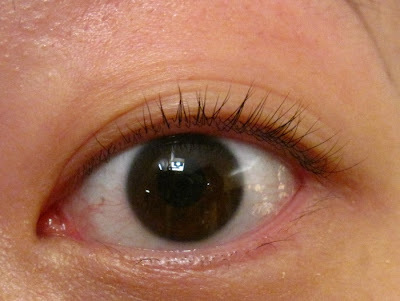 If you want a volumising mascara that gives greater impact, Benefit They're Real! will give you better results. The Suqqu mascara requires quite a bit of layering to build up the length but it doesn't clump or make the lashes feel stiff and crunchy after it dries. 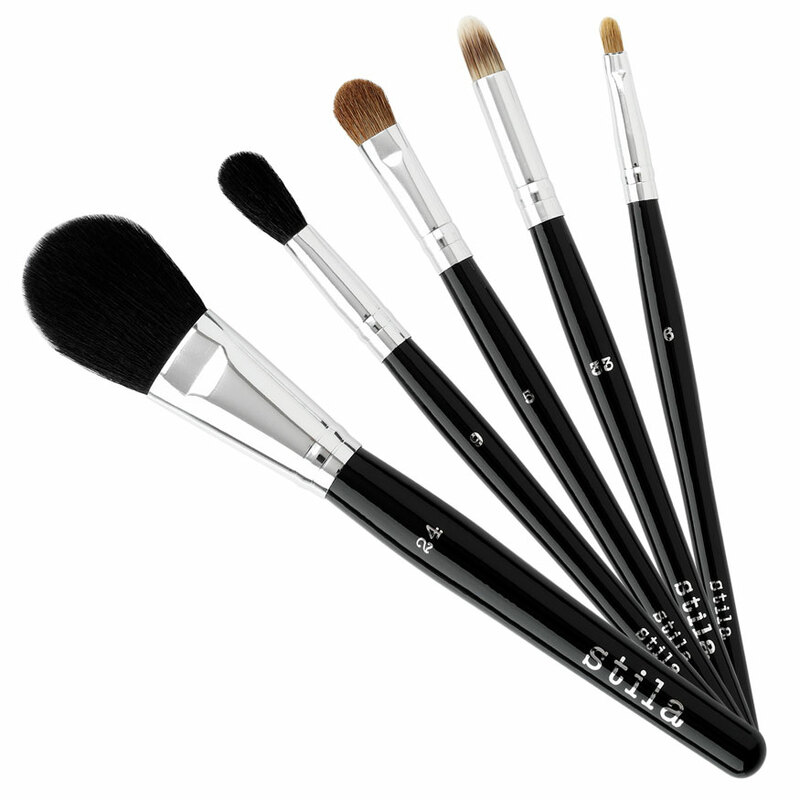 The slim brush also works well for defining and lengthening the super short and sparse lashes on my lower eyelid, without smudging against the skin. I couldn't remove this with my Bioderma Sebium H2O but it came off with the Body Shop Shiso Make-up Cleansing Oil. 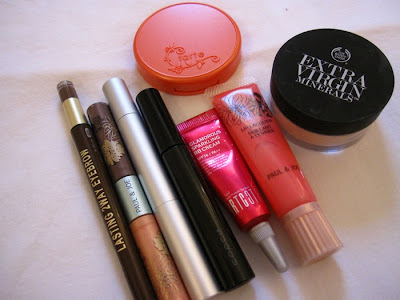 Even for mascaras that are supposed to be removable with warm water, I prefer to use an eye makeup remover or cleansing oil to avoid having to rub the lashes too much. 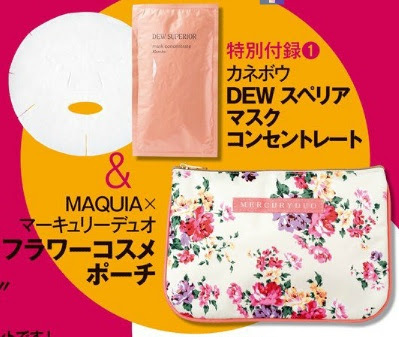 Overall, I think Suqqu Mascara Volume Long N is a decent mascara and I will continue to use it regularly but it didn't impress me enough to justify the exorbitant price tag. 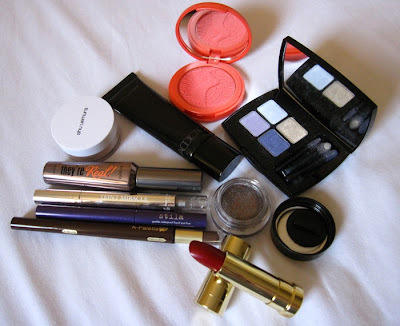 The products used for this look include: BRTC Glamorous Sparkling BB Cream, Body Shop Extra Virgin Minerals Loose Powder Foundation 102 Natural Ivory, Tarte Tipsy blush, Paul & Joe Lip Lacquer 05 and Eye Gloss Duo B 03, RMK Super Basic Liquid Concealer EX-01 and K-Palette Lasting 2-Way Eyebrow 01. The BRTC BB cream is thus named as it contains soft shimmer particles to give the skin a refined glow. Although it was a good match for my skintone, the finish was too dewy for my liking and it didn't even out the skin surface as well as some other foundations that I've tried. Oil control was average with blotting required every couple of hours. 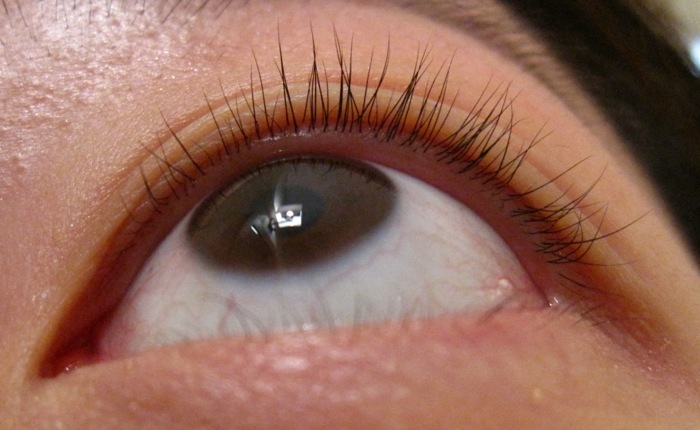 The ultra fine shimmer particles were only visible when viewed up close under direct sunlight. 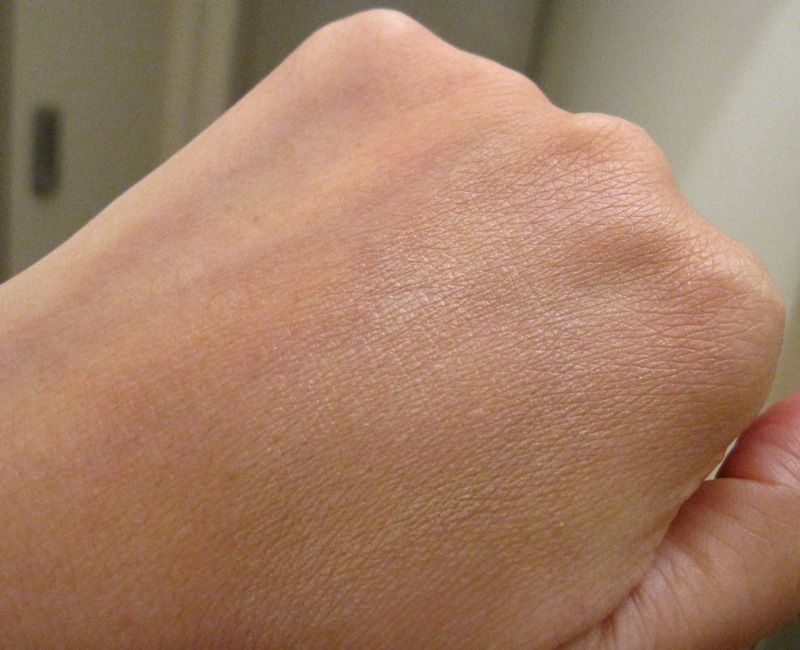 In the photo below, I swatched it on the right half of my hand. Fortunately, I only paid about S$2 for a 5ml tube (as part of a sampler pack of 4 BRTC BB creams) from Guardian Pharmacy. 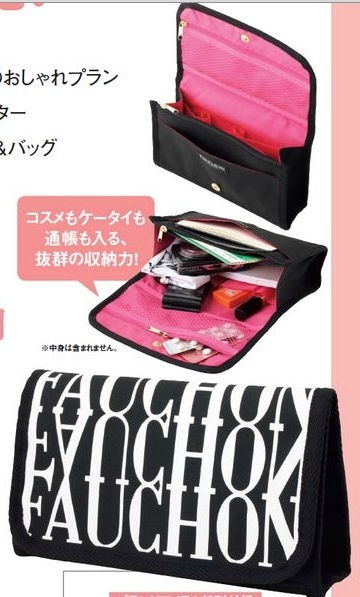 Here's a preview of the freebies for Japanese magazines in September. The release dates listed below are for Japan so please check directly with Kinokuniya if you wish to know when they will arrive in Singapore. Kino's air shipments are usually on Wednesdays and Fridays. With (28 Sep): November issue comes with Jill Stuart pouch, with 3 interior pockets and 2 exterior pockets, and tissue case. The new Dolly Girl by Anna Sui mook, which includes a reversible tote (40x26x20cm), and To b. by agnes b. mook are now available at Kinokuniya stores in Singapore. 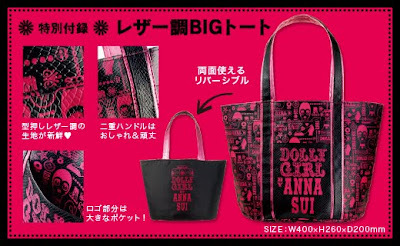 You can see pics of the Anna Sui bag on this blog. It's not even September yet but Stilacosmetics.com and Sephora.com have already started listing the Dream In Full Colour holiday collection! The excellent Lipglossiping posted gorgeous photos of the collection earlier, which had me gasping at the dreamcatcher-styled palettes. 1. 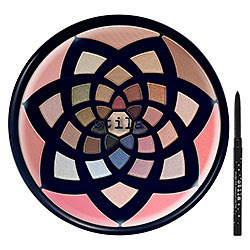 Dream In Full Color Palette (US$39): 29 eye shadows (total net weight:0.65 oz. /18.5 g), seven cheek colors (0.38 oz. /10.8 g), a Smudge Stick Waterproof Eye Liner in Stingray, and a 12 -page step-by-step look book. 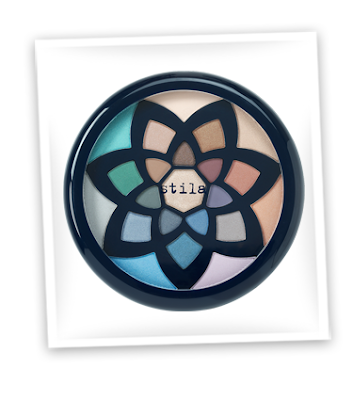 In the e-mailer sent out by Stila today, there is also a Find Your Magic Palette pictured but it's not listed on Stilacosmetics.com. 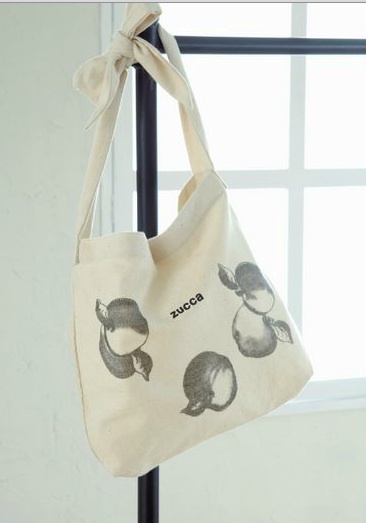 Hopefully, it'll show up later as I definitely would like to add it to my collection! 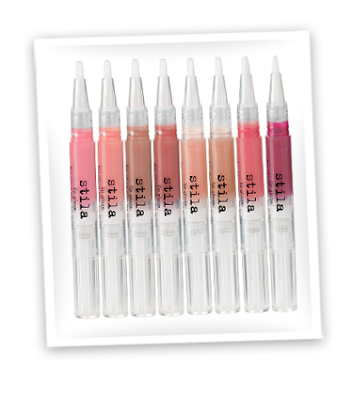 If you are in the US, you can enter Stila's sweepstakes on their Facebook page to win the entire collection (no purchase is necessary). For a sneak peek of the holiday offerings from Lush this year, check out Hirona's blog. Several products from previous years are being brought back like Satsuma Santa, Snow Dome soap and Christmas Eve soap. There is also a yummylicious Rudolph Chocolate Massage Bar, a Melting Snowman bath melt, a Magic Stick bubble bar shaped like a pink star, a lime green Sparkling New York City shower jelly with notes of cinnamon and gold glitter, a Snow Taffy soap and bath bombs shaped like Ginger Cookie House and ribbon-wrapped boxes. 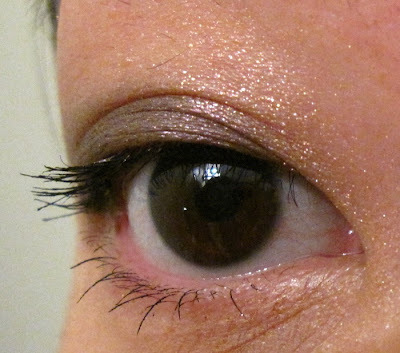 If you are a YSL fan, do check out this Japanese blog for several posts on the YSL holiday 2011 collection. 1. 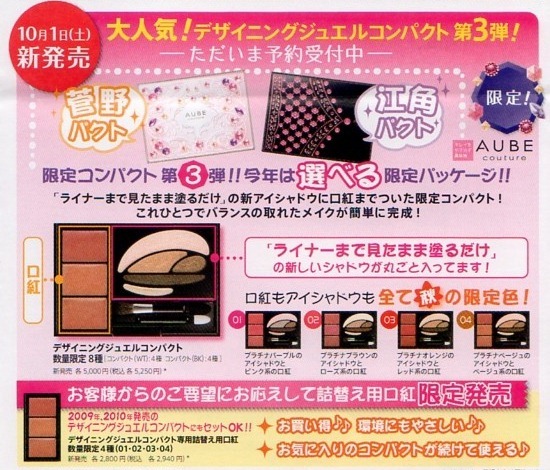 Palette Noel (7980yen): One white eyeshadow and four black/grey eyeshadows in varying textures. 4. Manicure Duo No. 6 Duo Noel: Matte black and glossy black. 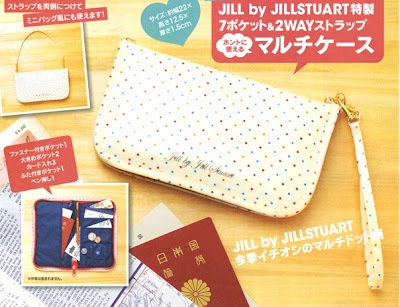 (4725yen; 2x6ml) See a close-up of the model's manicure in the ad visual here. 5. 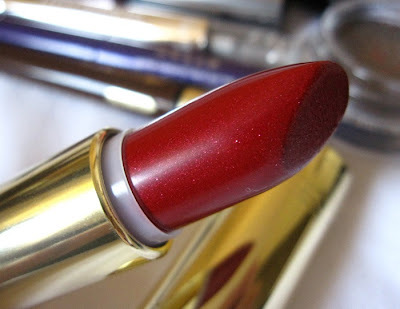 Rouge Pur Couture (3885yen) : No. 37, No. 30 Rosé Aphrodite, No. 39 (LE) and No. 40 Rouge Eros (LE). 6. 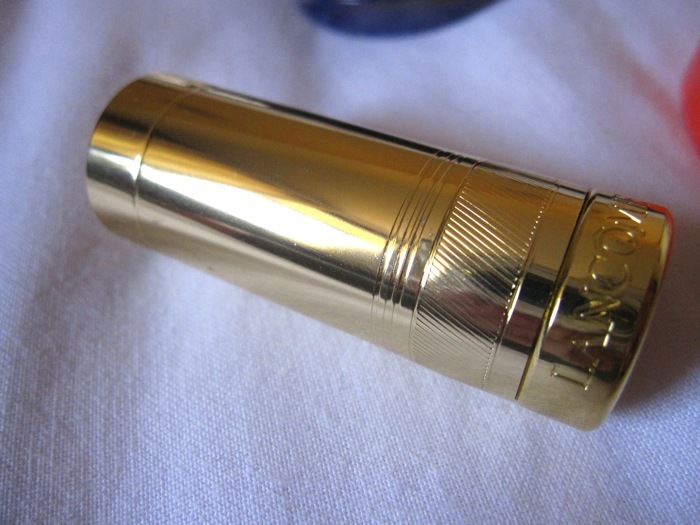 Golden Gloss (3465yen): No. 44 White Gold Diamond, No. 45 White Gold Pearl, No. 46 White Gold Quartz, No. 47 White Gold Topaz and No. 48 White Gold Amethyst. All are limited edition except No. 44. Both the Palette Noel and Palette Blanc come with a black obi. 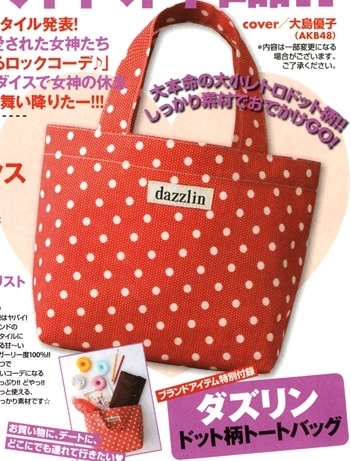 See more pics on Kuri's Beauty Report and Rascal. 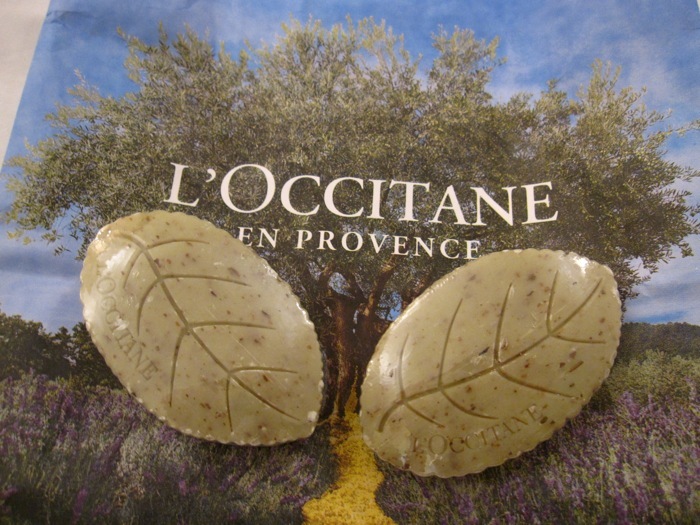 Biteki.com has a sneak peek of L'Occitane's holiday collections. 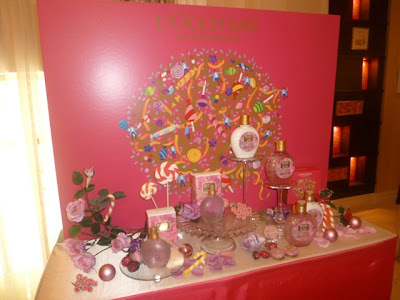 First up is the Delice des Fleurs fragrance and bodycare collection, which will be released on 27 October in Japan. The romantic floral scent has rose and violet notes. It includes an eau de toilette, solid perfume, shower gel, body milk, hand cream and lipgloss. 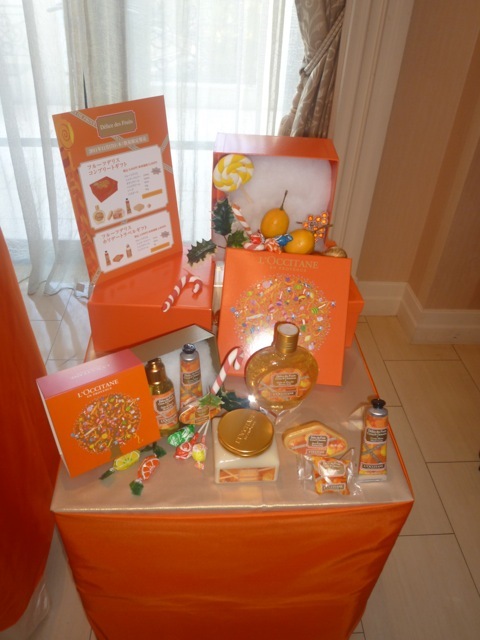 The Delice des Fruits collection will be launched on 17 November. The juicy citrus scent also has notes of cedar and musk. The line-up includes a body milk, shower jelly, hand cream, soap, lip balm etc. 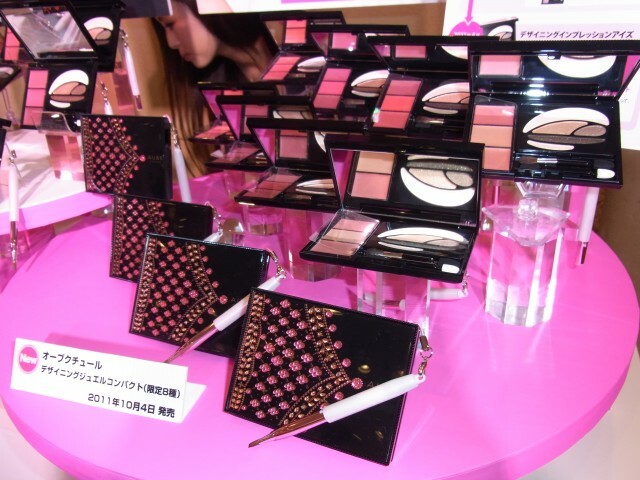 See more pics from the press event in Tokyo on Kuri's Beauty Report. Canmake will release a new Moist Souffle Shadow (714yen) on 1 September in Japan. Available in three shades, the souffle shadows transform into a powder upon contact with skin, providing a translucent, shimmery wash of colour. They are formulated with seven hydrating ingredients: hyaluronic acid, royal jelly, squalene, aloe vera, honey, extracts of rosemary and geranium. 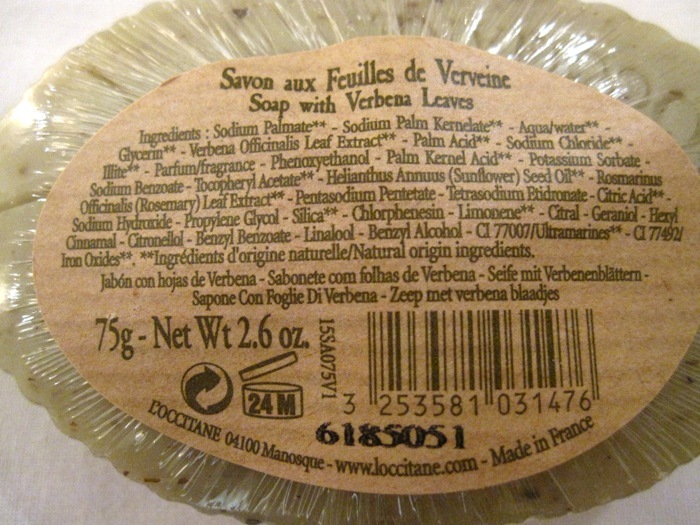 Last week, I got tired of dealing with the slippery Lush Sweetie Pie Shower Jelly, so I popped into L'Occitane and picked up their Verbena Leaf Soap (S$10). I love the fresh citrusy scent of L'Occitane's Verbena range, which isn't too sharp or generic. I've tried both the Verbena shampoo and conditioner previously but they didn't work well with my hair. 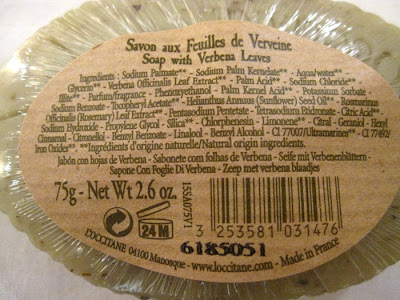 Aside from the lovely scent, I also like the good exfoliating action provided by the crushed verbena leaves in the soap. 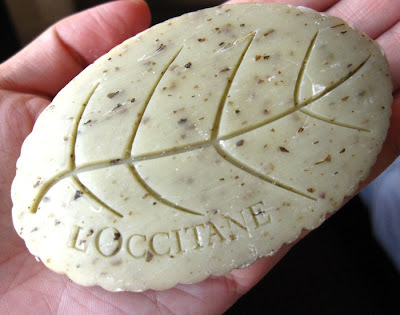 The scrubby bits don't feel as sharp on my skin as Lush Porridge Soap. 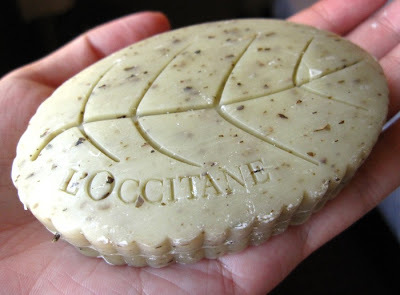 The all-vegetal, non-detergent cleansing base is supposed to be non-drying. 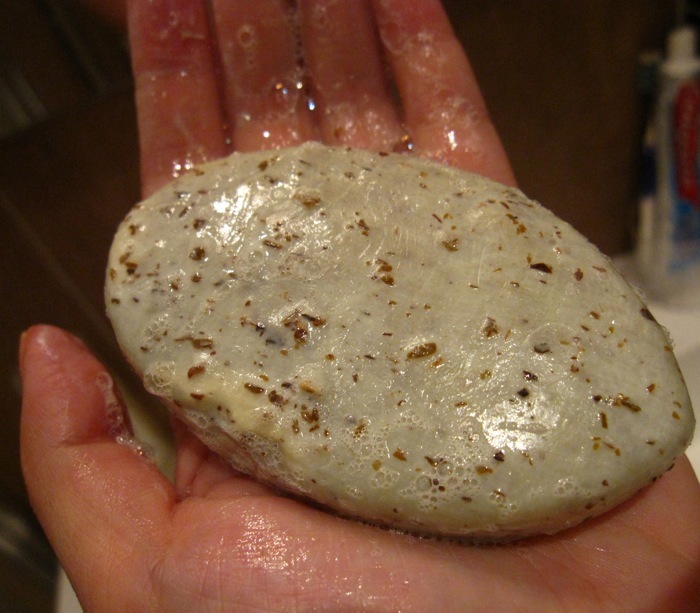 And indeed, it doesn't cause any dry patches or tightness on my skin after rinsing off, unlike many other bar soaps. Nevertheless, I still use a body lotion post-shower to keep my skin properly hydrated. It also lathers up much faster than Lush Shower Jelly and doesn't leave a strong scent on my skin. I like to use this especially if I've worn sunscreen lotion on that day, as this cleanses my skin thoroughly. Check out Namie Amuro's TV CM for the new Esprique Forming Beauty Pact UV (Moisture) foundation! This was shot on the island of Mallorca. The fragrance-free foundation has SPF20 PA++ and comes in 7 shades. It contains hyaluronic acid, collagen, "super flat powder" to conceal pores and "shape effect powder" to help the face look slimmer. The Esprique website also has a clip on the shooting of the ad here. The Esprique brand is launching at Kose counters in Singapore this month, replacing Esprique Precious (which I will miss sorely!). You can read more about Esprique on Shine, Shimmer & Sparkle and Everbluec. Yuki's Lazy Channel and Worship at the House of Blues also have swatches of the new Blend Dimensional Eyes palettes for fall. As part of its 29 Rue St Honoré fall makeup collection, Lancome released three Le French Touch Absolue lipsticks: Rouge St. Honoré, Rouge Faubourg and Rouge 29. The luxurious gold packaging is a modernized version of Lancome's first lipstick, known as "Shaker". Of the three shades, Singapore will be receiving only Rouge 29 (S$65). It seems like only the European countries will be receiving all three shades. 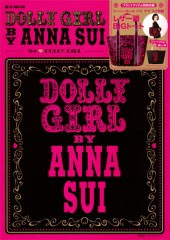 (Beaut.ie has the details on the European release.) The Maison Lancome blush looks very nicely put together in the pan but when swirled and applied, it's basically just a pink-toned face powder with a dreamy finish so I skipped it. 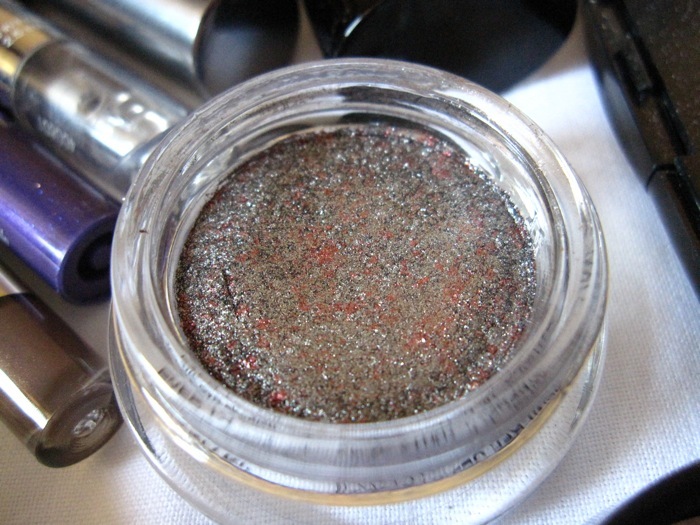 I got to play with all three shades recently and decided to purchase #104 Rouge Faubourg, a vibrant red with red micro shimmer. Rouge Faubourg has excellent colour payoff and wears very comfortably on the lips. 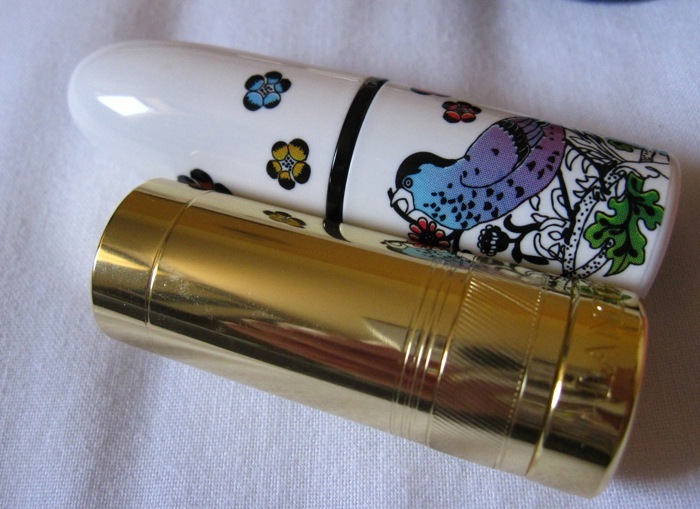 True to the description on the box of it as a "silky cream", it glides onto the lips very smoothly for a velvety, satin finish. 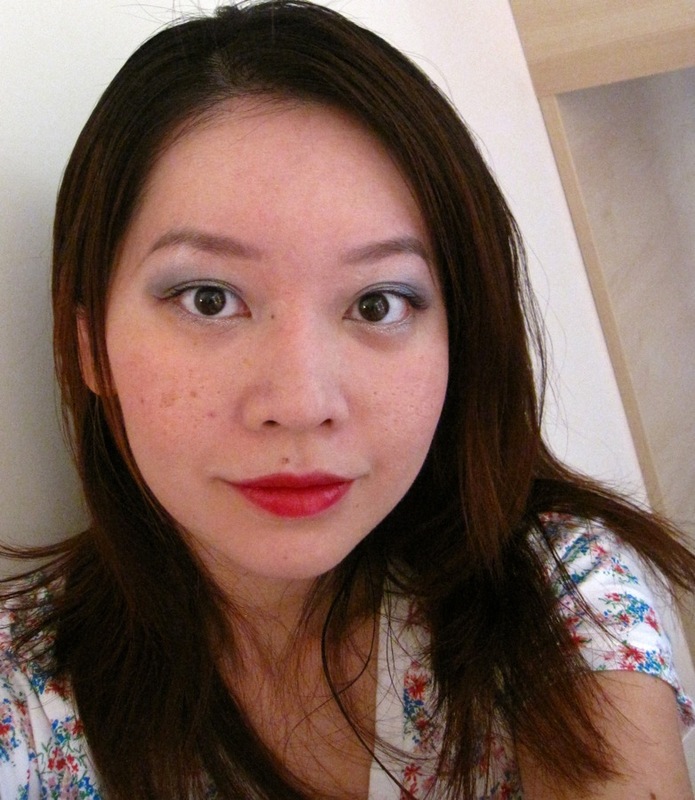 The micro shimmer is not really visible on the lips. It does stain the cup when drinking and requires touching up after a meal. I also tried out the Giorgio Armani Eyes To Kill #4 Pulp Fiction today. It is a metallic grey with red flecks. I applied Pulp Fiction along the lower lashline and from the upper lashline to the crease, without any primer underneath. 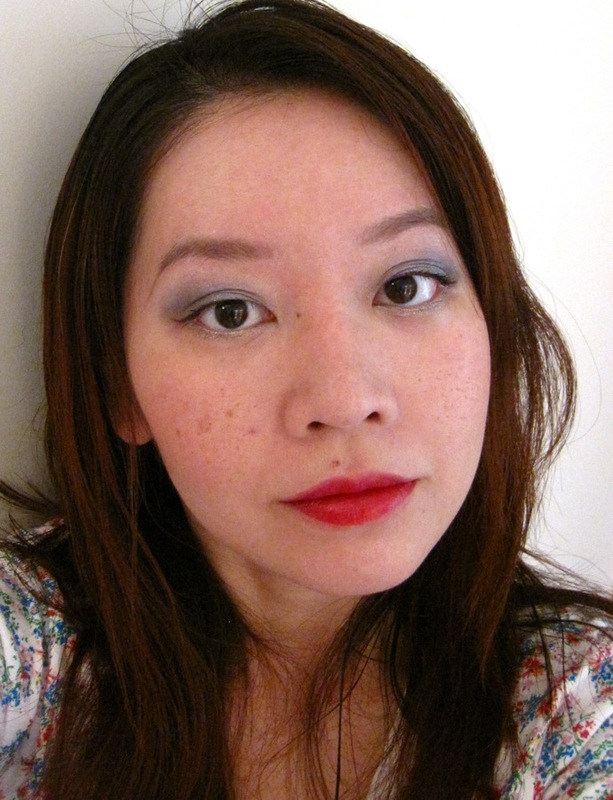 I used a pale blue shade from my Lancome Ultra Lavande Cold Harmony palette over the brow bone area and the blue-toned purple shade in the crease. The Eyes To Kill has truly impressive lasting power. I didn't see any fading or creasing even after more than 12 hours of wear. However, Pulp Fiction didn't strike me as being a particularly unique shade. After trying the two Eyes to Kill shades that I purchased (Pulp Fiction and #3 Purpura), I think they are good quality but I'm just not in love with them enough to want to pick up more shades. 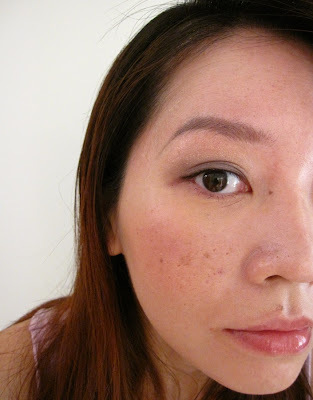 For today's look, I also used Addiction Tinted Moisturiser #1, Shu Uemura Face Powder Sheer, Stila Sparkle Waterproof Liquid Eye Liner in Royal, K-Palette Real Lasting Eyebrow 01, Tarte Tipsy blush, Lancome Natural Light Creator Bare Skin Perfecting Corrector Pen #1 and Benefit They're Real! Mascara.